Kay Greidanus was born in Den Haag, a city at the west coast of the Netherlands. He graduated from the theatre academy in Maastricht in the summer of 2013. After graduation, he played in numerous theatre productions and worked with many renowned actors and directors. 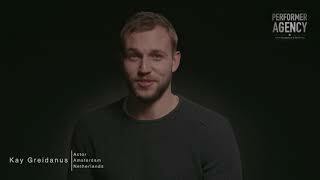 Kay made his national breakthrough with the internationally acclaimed short movie, Sevilla, for wich they won a “Gouden Kalf” (One of the most prestigious Dutch film awards) at the annual Dutch Film Festival. Since his first appearance on the big screen, Greidanus has starred in many film and television productions. In 2016 he played the leading character in the feature film: “Riphagen”. A Second World War drama based on true events, worldwide available on Netflix. In 2017 Kay worked with director Ken Scott on the set of The Extraordinary Journey of the Fakir. That same year, the film “Huisvrouwen Bestaan Niet” became a national box office hit and ended up being the most successful Dutch movie of the year. Kay is now filming for two new Dutch television series. And is exploring to work internationally.